Julia Child 1963. French Chef TV Programme. 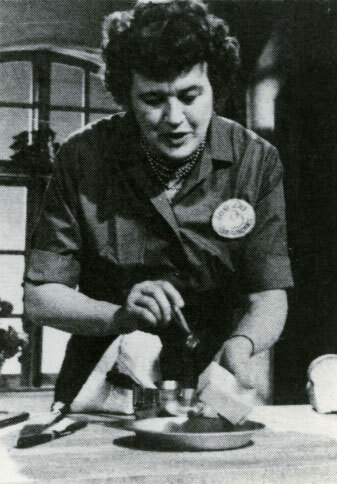 Julia Child was the person who more than anyone else brought French cooking to North American middle-class households as a TV personality and author. She is only familiar to North Americans, though; she remains mostly unknown in Britain and in Europe. Julia was very tall — six feet two inches (188 cm.) She described herself as a “natural ham” with her breezy approach on her TV shows. She was always very definite, though, that she was not a TV entertainer, but rather an educator on TV. She presented cooking as fun for the viewers — she didn’t seem too concerned about being messy in her cooking — but actually felt that cooking was a discipline. Julia wasn’t keen on Italian and Mexican food. Italian food lacked the sort of technique that interested her about French food, and she found Mexican food too spicy (until her final days in Montecito, California.) She also didn’t like grilled vegetables. She wasn’t a food snob, though: she liked beer, and would buy Wonder Bread and iceberg lettuce and hamburgers. And, she was open to modern gadgets: she popularized the food processor, and the blow torch and was amongst the first to have a bottom-freezer fridge in North America. Still, to the end, she disapproved of bottled salad dressings. A friend of Canadian-born John Kenneth Galbraith (economist, 1908 – 2006), Julia was also, like Galbraith, a Democrat. But she was no populist. She berated the “Food Network”, saying that the attention span of the audience they attracted was too short, wanting entertainment rather than education. She referred to “very popular shows on the Food Network which your gas station attendants will look at…..” She said that public television (PBS in America) was the “many paying for the few, but we need that for the few people who are serious about what they are doing… specialized group of people who want to be educated or enlightened in special things.” On the other hand, while she praised public television for showing teaching programmes (such as hers) that commercial TV wouldn’t, because commercial TV had to make money, she certainly liked to make money herself and ended up a very rich woman. She said of public television, “PBS never pays much of anything.” Some say that she was somewhat elitist, with her disdain for Italian food, and her emphasis on training and serious study. Others argue that she patently wasn’t, because she sought to bring French cooking to ordinary (upper middle-class) American kitchens. Julia would say of the British class system, “We’re lucky in this country, we don’t have that”, but she was pretty high up on the class scale in her own country. She and her husband had a second home, a house they built in Provence, France, and she pronounced “tomatoes” the British way. And she was conservative in some ways, extolling long hours in the kitchen at a time when working-class women were just trying to break free of it. She felt that good cooking had to come out of tradition, and by tradition, she meant French tradition, and women in the kitchen. The first truly fancy French restaurant she dined at was during the years she and her husband lived in Paris, a restaurant called “Le Grand Vefour” on the northern side of the Palais Royal, when Raymond Olivier was the chef. Julia Child remains unknown in France. 1912 — Julia Child was born Julia Carolyn McWilliams on 15 August 1912 in Pasadena, California. 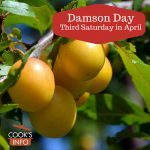 Her father, John McWilliams (1880 – 1962), was a 1901 Princeton graduate from Chicago who became a “farm consultant,” and then became wealthy through investments that had paid off for him. He would later help finance Richard Nixon’s first political campaign. Her mother was a red-head, née Carolyn Weston (1877 – 1937, nickname “Caro”), who didn’t have to work, and didn’t cook much. From “old Massachusetts money”, she grew up in a house that had servants, nurses, a governess, a coachman, and cooks. Nevertheless, Caro was the first woman in Dalton County, Massachusetts to get a driver’s licence. John and Caro had met at the Chicago World’s Fair in 1903, married on 21 January 1911, and moved out to Pasadena, California, where John’s family was originally from. They set up house with a cook and a maid. Julia was the eldest of three children. Her brother’s name was Byron Weston McWilliams; her sister, named Dorothy. She went first to a girl’s boarding school, the Katherine Branson School in Ross, Marin County, California. Her family was untouched by the Great Depression. She described her family as a “moderate income” family, but she was from a class of women who were expected to enter into the “leisure class”, unlike working class women. 1942 — By now the United States had joined the rest of the allies in the Second World War. Julia knew how to type, which landed her a job for the US Information Agency in Washington, then a job transfer to the Office of Strategic Services (now the CIA.) During the war, she continued working for them, and was posted in their offices in Kandy, Ceylon (now Sri Lanka), as a filing clerk. She travelled there by way of Bombay, then by train across India to Madras, then onto Ceylon. 1943 — While Julia was in Ceylon, she met Paul Cushing Child (born in New Jersey, grew up in Maine; 15 Jan 1902 – 12 May 1994), head of the “chart-making” division there. Originally from Maine, he was a Francophile who appreciated good food. He spoke French fluently, and had taught at a boy’s boarding school in the Dordogne in France. He was also a passionate amateur photographer. Paul was 5 feet, 11 inches, and 10 years older than her. Julia said she started to get interested in food in Ceylon. At first the staff were fed native food, but when people started getting dysentery, the military took over catering them. Julia said that the military food was so bad, that everyone would sit around and talk about good food they remembered. 1945 — Julia and Paul both returned to America in 1945. She returned to Pasadena; he went to stay with his brother in Washington. The two kept in touch, and did a visit together to his family in Maine. In the same year, Julia followed up her new interest in food with some cooking studies at the Hillcliffe School of Cookery in Beverly Hills. 1946 — Julia and Paul got married in September in Lumberville, Pennsylvania, after a road trip from California to Washington. They spent a year in Washington. (The couple had no children.) She changed her name when she got married to Julia McWilliams Child, but never used the McWilliams part professionally. 1950 — Julia graduated from Cordon Bleu. 1951 — Julia, along with Simone Beck and a third woman, Louisette Bertholle, started a cooking school in Paris that they called “l’École des Trois Gourmandes” (the school of the three gourmets) to teach cooking to Americans in Paris who didn’t have enough French for Cordon Bleu. They taught in their apartments, but didn’t make any money on it. She said they’d buy the ingredients for the classes, but then people would often cancel, causing them to lose money. At the time, Simone was already working on a book with Louisette. The two already had a third person as a collaborator, but he died and Julia was invited to take his place. A publisher had already agreed to take on the book, but Julia managed via a friend to get a small trial excerpt of it (on soups and sauces) into the hands of Houghton Mifflin publishers, who said they wanted it. In the end, though, Houghton Mifflin changed its mind: they said no one in America would ever want to do that kind of cooking. The book went to Alfred A. Knopf, who published it as “Mastering the Art of French Cooking.” The book started off as Simone’s child, but by the time the book moved to American publication with Knopf, Julia had taken the lead and become the star. After Paris, Julia and Paul lived briefly in Marseilles, until about 1954, then German, and finally in Norway. 1956 — Julia and Paul returned to America and moved to Cambridge, Massachusetts. She would live the same house there at 103 Irving Street until 2001. 1961 — Julia and Paul build a vacation house in Plascassier in the south of France, near the vacation property there owned by her friend Simone Beck. They would keep it until 1992, travelling there every winter. 1963 — Julia started her TV programme, “The French Chef”, at the age of 51, produced by WGBH-TV out of Boston, Massachusetts. The programme ran for 119 episodes until 1966, and then again for one year from 1970 to 1971. The television show came about while she was promoting her book. In February 1962, she had landed a few minutes on a live WGBH TV programme to talk about the book, and as part of her time on air, she whipped up an omelette. Both the producers and viewers were taken by her cooking style on TV. They commissioned three cooking episodes with her as a trial balloon. The first show was broadcast on 11 February 1963 (though her own recollections were that it wasn’t shown until summer.) For it, she made boeuf bourguignon. For the last of the three trial episodes, she made French Onion soup. She went too fast in that last show, and finished eight minutes too early. Still, the trial balloon shows had gone so well that a series of thirteen episodes were officially commissioned. Sadly, these thirteen episodes have been lost to us. They were taped on old, used tape, which later just degraded away with time. In any event, the black-and-white thirteen-episode programme was picked up by a station in Pittsburgh, then San Francisco, then New York. She was paid $50 an episode, plus a budget for ingredients. Paul helped her with the prep for the shows. At the time, many of her TV crew had never eaten fresh asparagus or fresh artichokes, and you couldn’t buy leeks. She ended every episode sitting at a table, saying “Bon appetit.” Julia was hitting the air waves just at the right time. The Kennedys in the White House, about whom everything was news, had a French chef. And, the age of transatlantic travel had just begun, when Americans could fly to France in a matter of hours, rather than days by liner. This 1963 series is sometimes claimed by Americans to have been the first cooking programme ever on TV. It wasn’t, however: there was Lena Richards on WDSU TV in New Orleans from 1947 to 1949, as well as Philip Harben in Britain in 1946 and Fanny Craddock, for the BBC. 1966 — Julia was featured on cover of Time Magazine on 25 November 1966. 1966 — The French chef went off the air for 4 years. 1967 — Award: Julia was awarded the “Ordre de Mérite Agricole” by France. 1968 — Had a mastectomy. 1970 — Julia publishes Volume Two of “Mastering the Art of French Cooking.” She wanted (based on a suggestion from a Judith Jones) to have a recipe for a classic French baguette. She assigned the task of experimenting to her husband Paul, who made an estimated 60 loaves before giving up. He pointed Julia, however to Raymond Calvel, a bread expert in France, and based on assistance from Calvel, Julia developed an eleven-page recipe that would work in North America for a classic French baguette. While stories of her collaboration with Calvel are known in the food world in North America, biographies of Calvel do not mention Child at all. 1970 — The French Chef TV programme starts up again, this time in colour. It ran for only one year until it was cancelled. 1976 — Award: Julia was awarded the “Ordre de Mérite National” by France. 1981 — Julia co-founded the “American Institute of Wine and Food” (San Francisco), along with Robert Mondavi and Richard Graff (1937–1998). 1994 — Julia’s husband, Paul, died. 1994 — Julia gave money for a $200,000 trust fund at Smith College. 1996 — She did a TV programme called “Baking with Julia.” It ran for 39 episodes; during them, she had 26 bakers on the show. 1997 — For her 85th birthday, Julia got a private tour of the White House. While in Washington, she got to have lunch with Katharine Graham (1916 – 2001), owner of the Washington Post. 2000 — Award: Julia was awarded the “Chevalier of the Légion d’Honneur” by France. 2002 — She had knee-replacement surgery. 2003 — Award. Julia was awarded the American Presidential Medal of Freedom by President Bush. 2004 — Julia Child died in her sleep on Friday, 12 August 2004, aged 91, just 2 days before her 92nd birthday, of kidney failure. “Dining with one’s friends and beloved family is certainly one of life’s primal and most innocent delights, one that is both soul-satisfying and eternal. In spite of food fads, fitness programs, and health concerns, we must never lose sight of a beautifully conceived meal.” — Julia Child. The Way to Cook. “If people aren’t interested in food, I’m not very much interested in them. They seem to lack something in their personality.” — Julia Child. “Cilantro and arugula I don’t like at all. They’re both green herbs, they have kind of a dead taste to me. I would pick it out if I saw it and throw it on the floor.” — Julia Child, in 2002 television interview with Larry King. When reached by telephone at 9 o’clock on a weekday morning, Julia Child said she and her husband Paul were having one of their favorite breakfasts — two oysters each and some orange juice. “Well, I do love tuna fish sandwiches,” Mrs. Child began, “and also chocolate ice cream sodas, peanut butter, which I resist, and those cute little goldfish crackers people serve with cocktails. And then, of course, hot dogs and hamburgers with onion, pickles and catsup.” — Mimi Sheraton. Food Junkie confessions. NY Times News Service. In Independent Press-Telegram. Long Beach, California. Wednesday, 19 May 1976. Page F2. “Yes, a major American woman …. [part of] the first wave… the opposite of today’s victim psychology and so on. In the history of women, Julia Child obviously plays an enormous role. And the neglect of her career – you know, by the Feminist Establishment, by Women’s Studies, and so on–is very typical. This very achieving, practical woman – commanding as an admiral on a warship, for heaven’s sake, at the height of the British Empire – naturally doesn’t fit into the narrow view of the callow little Women’s Studies people.” — Paglia, Camille. In an interview with Chris Lydon . “Does anybody actually believe that Julia Child would be anything but a fossilized slab of butter in the Smithsonian if it weren’t for Julie Powell’s gauchely refreshing blogs and books?” — Alexandra Gill. The death of Gourmet. Toronto: The Globe and Mail. 6 October 2009. “Child’s recipe for her signature boeuf bourguignon is three pages long and took as much effort and concentration as preparing a lecture – maybe more. But it earned no money and commanded no real respect or reordering of the domestic order. It was basically a hobby for ladies of leisure.” — Politt, Katha. Julie & Julia’s real-life women. Manchester. The Guardian. 6 September 2009. Julia Child loved the hotdogs at Costco: “While living in Santa Barbara, the couple [Ed: Caroline & Ken Bates] were invited to a dinner cooked by celebrity chef Julia Child, who had a home there. “There were six of us, and she did everything,” says Ken. “She would come out of the kitchen with this big tray with all the dishes on it.” He also recalls how Child sat under the umbrellas at Costco in Santa Barbara, devouring the discount store’s hot dogs. “She was so very unphony,” says Caroline.” — Henry, Bonnie. Critic for now-gone Gourmet magazine savors the memories. Tuscson, Arizona: Arizona Daily Star. Monday, 28 December 2009. Sadly, according to the snopes.com myth busting web site, it’s a myth that Julia Child dropped a turkey / chicken on the floor in the TV set’s kitchen, picked it up, kept on using it, and said to viewers something along the lines of, “Remember, you’re alone in the kitchen.” Even though many people swear they remember it. (The same episode has been credited to Fanny Cradock.) It’s been an urban myth bandied about since at least 1989. For the PBS special Julia Child’s Kitchen Wisdom, her producer Geoffrey Drummond had to review more than 700 episodes of her shows, and says he never saw a dropped chicken or turkey. Julia’s pots and pans originally went to COPIA, the American Center for Wine, Food & the Arts, in Napa, California. When the center went bankrupt in December 2008, the Child family transferred them to the Smithsonian to re-unite them with the rest of the kitchen. Py-Lieberman, Beth. Julia Child’s Pots and Pans Are Back in Her Kitchen. Smithsonian Magazine. 29 July 2009. Stewart, David. Empowered to cook: Julia gives us the courage, shows us her joy. Takoma Park, Maryland: Current. 8 June 1998. [3b] Gay Man Sues Child, Calls Her Homophobic. Deseret News, 3 February 1992. Parsons, Russ. Julie, Julia and me: Now it can be told. Los Angeles Times. 12 August 2009. Wilson, Craig. Celebs savor Montecito’s exorbitant vistas. USA Today. 30 January 2002. Child, Julia. The Master of French Food Remembers Early Days in Paris. Paris: International Herald Tribune. 29 December 2000. Child, Julia with Alex Prud’homme. My Life in France. New York: Alfred A. Knopf. 2006. De la Baume, Maia. A French Chef Whose Appeal Doesn’t Translate. New York: New York Times. 16 September 2009. Pollan, Michael. Out of the Kitchen, Onto the Couch. New York Times. 29 July 2009. Rosen, Michael. Interview with Julia Child for Archive of American Television Interview in Cambridge, Massachusetts. 25 June 1999. Shapiro, Laura. The Trouble with Julie & Julia. New York: Gourmet Magazine. 30 July 2009. Shapiro, Laura. Julia Child: A Life. New York: Penguin. 2009. Spano, Susan. France was her entree, then the world was her oyster. Los Angeles: Los Angeles Times. 10 December 2006. Tomkins, Calvin. Good Cooking. New York: The New Yorker. 12 December 1976.